Making model engines requires frequent rounding over of the ends of linkages, clevises, etc.. I made this jig to simplify this operation. Top view. The part to be rounded pivots on a central pin which can be changed to suit the size of the hole in the part. The two stops are absolute essentials since the cutter (For safety, I use a rotary file rather than an endmill.) has a tendency to grab the work and pull it out of one's hands. The main bar of the stop is repositionable and can be swung into rough location. Setscrews in the end of the main bar then allow the secondary bars to be slid in and out for fine adjustment. A view of the underside. The big block is grasped in the milling machine vise. 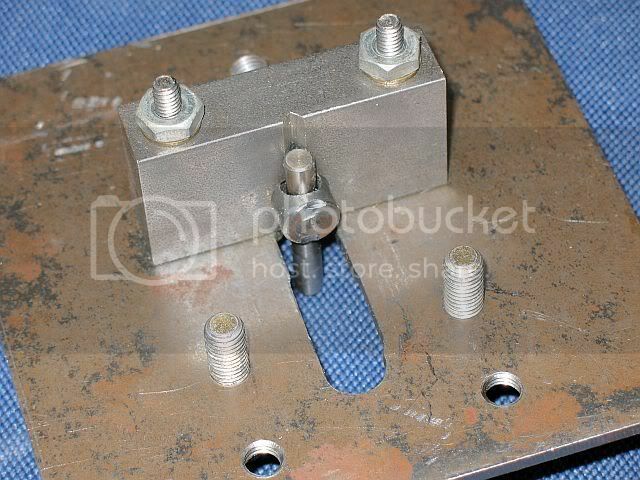 Through the big block is a threaded rod with a hole into which the various pivot pins fit. Tightening the nut on the threaded rod locks the pivot pin into a V-groove in the main block to keep the pivot pin vertical. Another view of the bottom showing the pivot pin holding arrangement. 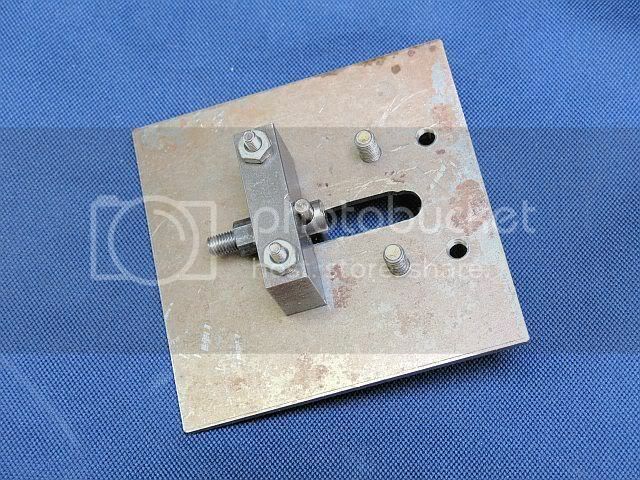 In use, the fixture is clamped in the mill vise. A rotary file, held in a collet, is lowered into the slot seen in the other pictures. 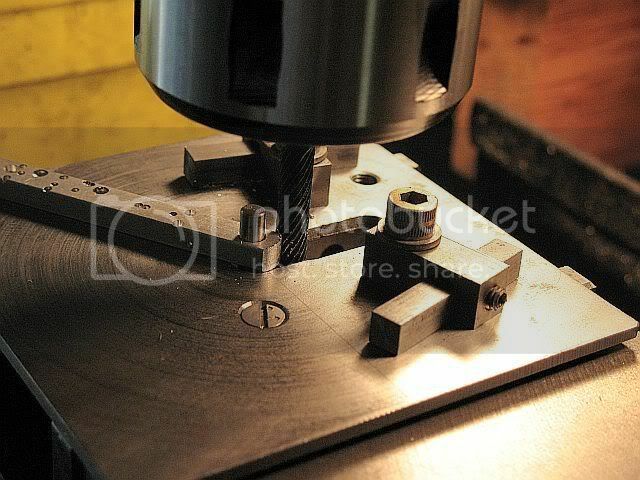 The y-axis is used to advance the work into the spinning file a few thou at a time. After each advance the work is swung back and forth between the stops to remove material. If you make one of these, exercise care in its use. Your hands will be close to the spinning collet and rotary file. For extremely small pieces, I solder the part to a larger piece of metal to use as a handle or else use a small hand vise to grip the workpiece. ..... now this I can use....I'm off to the shop. Thanks Marv, keep 'em coming !!! P.S. I'm assuming the rotary file is less prone to grabbing the work than an end mill ? Yes, slightly. Plus it seems to give a better finish. YMMV. There's a psychological effect as well. 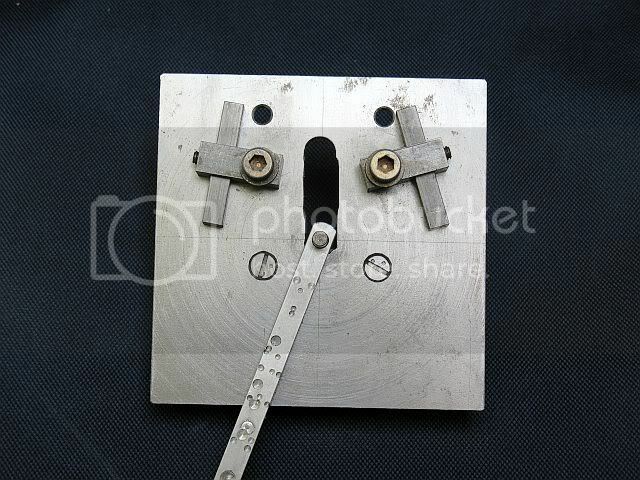 Since you're working with your hands so close to a moving cutter, I find the file a bit less intimidating. Needless to say, that's not a reason to relax one's vigilance. That's pretty cool Marv I like it! Especially that one can easily change the center pins to accommodate any and all hole diameters. Bad Behavior has blocked 15783 access attempts in the last 7 days.